A Build & Hang Glow-in-the-Dark Sticker Craft Kit. Who doesnÕt love glow-in-the-dark stickers?! With this kit kids can be serious and cosmic with planets, meteors, and stars, or silly and sci-fi with aliens and spaceships. Or both! Either way itÕs a great take-along item for cars, planes, restaurants, or any time you want a quick activity thatÕs easy to start, easy to clean up and so much fun to look at! 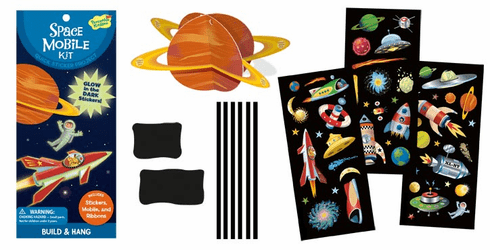 Kit includes 1 big planet mobile top, 10 mobile pieces, 6 ribbons, and 52 glow-in-the-dark stickers.